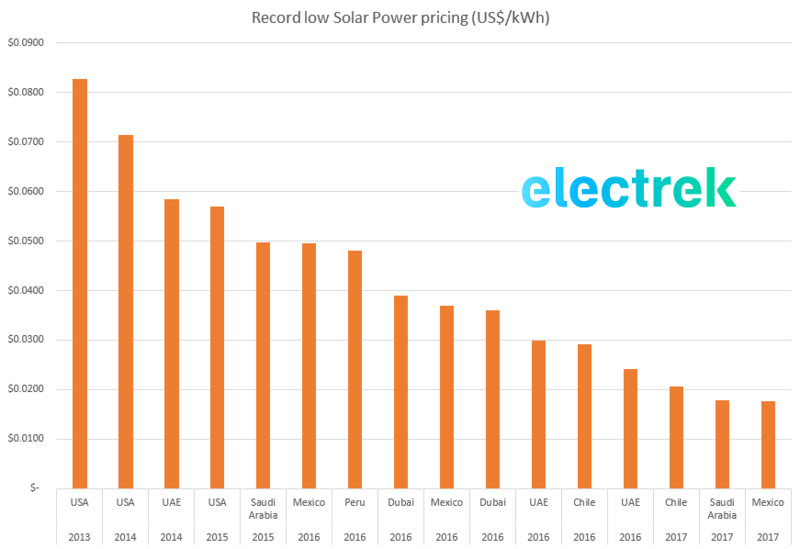 This record low price of green electricity on earth, just beats out the 1.79¢/kWh from Saudi Arabia, and is part of a pattern marching toward 1¢/kWh bids that are coming in 2019 (or sooner). 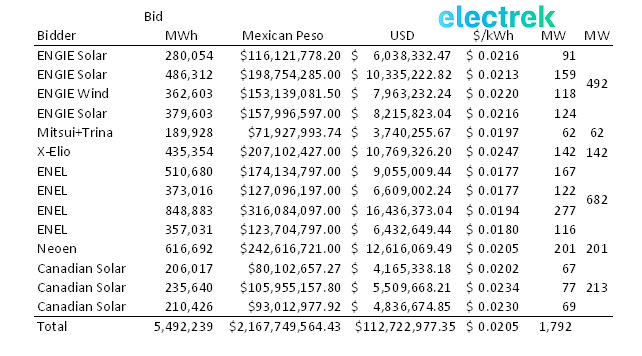 Mexico’s Department of Energy along with Cenace announced the results of the country’s ‘Third Long Term Auction.’ Fifteen bids were accepted from eight wind and solar power companies. ENGIE bid as Solar and Wind companies, Mitsui alongside Trina, ENEL and Canadian Solar were some of the better known names. ENEL won bids on four projects total with tariffs of 1.77¢, 1.77¢, 1.94¢ and 1.80¢/kWh. The projects were sized 167MW, 122MW, 277MW and 116MW, respectively – totaling 682MW total. These four bids are the two lowest, and 4th/5th lowest bids ever for solar power projects. The average bid price of all 5.5TWh of power of wind and solar, totalling 2.3GW of capacity, was 2.05¢/kWh. These projects are due to deliver power to the grid by 2020. The last two auctions, held last year, received average prices of 4.49¢/kWh and 3.17¢/kWh. More details on the bids will be released November 22nd. 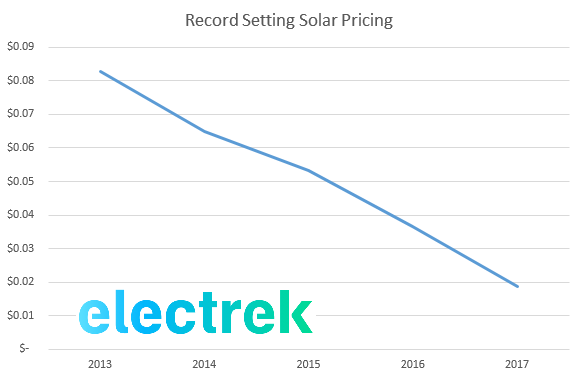 I predict that in 2019 we’re going to see 1¢/kWh from a solar power project – and this low price will be primarily driven by increasing solar panel efficiencies. I am bullish that efficiency will drive an additional 0.7¢/kWh out of solar power because right now we’re seeing laboratory efficiencies increase from a current standard of 16-17% solar panel efficiency toward a leading edge solar cell at 23.45% by JinkoSolar. Depending on how that cell efficiency translates to a panel, that’s an increase of up to 40% more efficiency based upon 16.5% solar panels. That means 40% less racking, 40% less labor laying our wiring and solar panels, 40% less maintenance and cleaning, 40% less land, etc. This efficiency gain is in addition to other technological advances. Drones are lowering long-term costs, international finance has more trust in solar, inverters are getting smarter and cheaper, re-powering is extending plant lives and companies are learning how to manage their projects better.